Meet Dr. Nadia Hashimi, the only woman Afghanistan-American who ran for Congress and would do it again. I considered these questions when I spoke with my friend Dr. Nadia Hashimi, who ran for a congressional seat in the U.S. House of Representatives from the 6th district of Maryland. Nadia and I shared honors classes together in high school. We were usually the two people of color—she is first-generation Afghanistan-American and I am African-American. Besides Nadia and I sharing a commonality of being minorities, we shared the same interest of educating our peers about diversity and inclusion so much so that we formed a club called B.I.A.S – Being Informed Active Students. The club presented programs about elections, voting, racism, and the impact of Martin Luther King Jr. on the country. These topics were heavy for 16-year-old girls at the time, but who knew that over 20 years later they would still resonate in our culture. I wasn’t surprised when Nadia posted on Facebook, in August 2017, that she considered running for Congress. I wondered, ”Can her network of friends assist her in this endeavor?” Life had prepared her to consider this next step and plus, who do you know would take a risk to form a club in high school that dealt with how we—white, beige, brown, and black people—dealt with each other? No one was really thinking about these things in 1994; but, Nadia did and still was. Nadia researched the polling done by the Democratic party and discovered that the main need of her district was affordable healthcare. She factored in her profession as a pediatrician and realized that she had a voice not only for herself but for her constituents as well. The Maryland 6th congressional district has a population of 761,921, according to ballotpedia.org, and is made up of Garrett, Allegany and Washington Counties as well as portions of Montgomery and Frederick Counties. The composition of the 6th congressional district consists of some rural sections just west of Washington, D.C. and touches the Pennsylvania border. The rural sections of the district tend to swing red and the metropolitan sections of this district become more diverse upon approaching the Washington, D.C area. The current boundaries of the district were recently the subject of a Supreme Court lawsuit over partisan gerrymandering. In the state of Maryland, it costs $100 to file for candidacy to run for U.S Congress. Financial disclosure is not required, nor do you have to set up a campaign account. The minimum age to file for a congressional candidate is 25. Interested candidates must be a U.S. citizen for 7 years and be an inhabitant of the state at the time of the election. After deciding to run, Nadia attended a 3-day boot camp training conducted by Emerge America. Emerge America offers in-depth training for Democratic women to turbo charge their campaigns offering critical elements of campaigning such as: campaign overview and structure, developing campaign plan and strategy, messaging and media relations, endorsements and power brokers, and public speaking. You name it, they cover it. They even have an extended 6-month training program geared towards campaign development. It is your network that will help you. Nadia’s campaign team consist of people who worked in political circles, but this didn’t happen overnight. By speaking with friends and conveying her intentions to run, Nadia acquired her finance director, campaign manager, and fundraiser through friends. Her campaign was credentialed with the people who made up her team; some of these individuals had worked at the White House, were former chief of staffs, or worked on high-profile campaigns in the past. Did I say that Nadia initially didn’t know her team? Let that marinate. Campaigning not only educated the potential voter but Nadia as well. She realized her initial networks; the Afghanistan-American community and the medical community were not heavily engaged in politics. “Physicians are not political givers,” Nadia said. “The immigrant community does not have the resources nor the history of political giving.” For this election cycle, there were only 2 candidates in the country running for office who were Afghanistan-American; Nadia and GOP candidate Omar Qudrat from California’s 52nd congressional district. “Some biases you can see as a woman, other biases are harder to see but you can feel them, you know them,” said Nadia. When she spoke with some people about her intention to run, she received the “look of like, humph, interesting…” she said. In encountering biases such as these, many would likely give up, but Nadia said, “You can’t give up on people right away; you are working hard to get every vote, every vote of confidence. You keep pressing until you overcome the bias. Even if you don’t win your naysayers over, at least your message is out there, and you must move around them,” said Nadia. Nadia is a wife, mother, doctor and bestselling author. I asked her how in the world did she do this campaign?! “My support team are my parents and my husband,” she said. It was “conscientious decision” to not be a doctor during this time and challenged all her energy into treating the campaign as business. “I couldn’t do this on a part-time basis, especially when someone was writing a check and putting their faith in you,” she said. Don’t self-doubt. “Someone believes in you so never question it,” Nadia said. “Their confidence in you should revitalize the faith instilled in you…You will not see a woman, especially a woman of color, run for office and take on a challenge if you don’t get comfortable in taking the risk to do these things!” she added. I had to ask Nadia the burning question that everyone wants to know, will she run again? 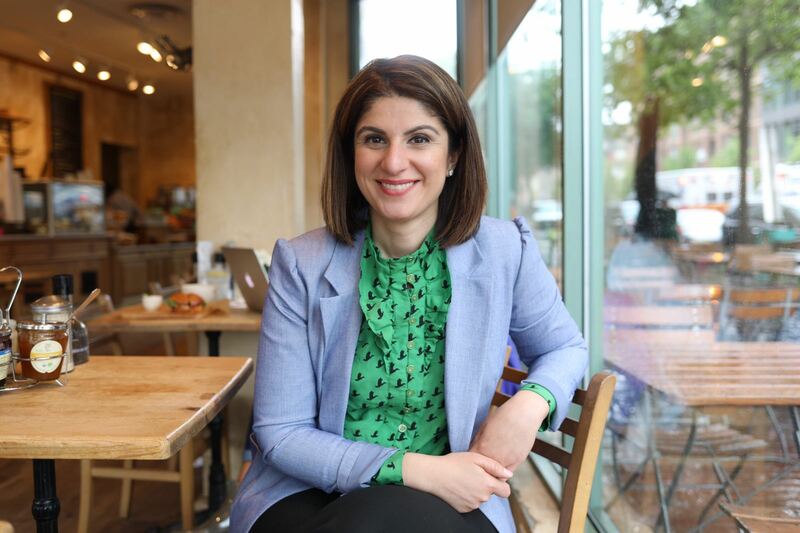 Out of the 8 candidates that ran for the Democratic primary ticket, Nadia finished 3rd in a crowded primary and only spent approximately $450,000 compared to the winner who spent nearly $11 million. I heard joy in her voice through the phone when she said, “I’m still out there talking to my community. I ran because I believed I could make a difference.” she said. Dr. Nadia Hashimi is a pediatrician, an internationally bestselling author, public speaker, and advocate for women’s rights. She has written three novels for adults and two for children, themed around issues such as poverty, war, migration, education, drug addiction and domestic violence. Her books have been translated into 12 languages and received multiple acclaims. She is a board member of Aschiana Foundation and lives with her husband and four children in Potomac, Maryland.